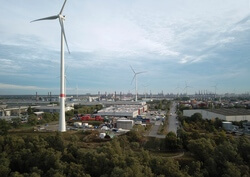 To kick off the Global Wind Summit, comprising WindEnergy Hamburg, the world’s leading wind energy expo, and the global WindEurope conference, Siemens Gamesa Renewable Energy (SGRE) will celebrate the topping-out ceremony of its electric thermal energy storage (ETES) facility in Hamburg-Altenwerder. With this innovative storage system, Siemens Gamesa is providing an answer to one of the central challenges facing the energy transition: how to make the supply and demand for electricity from renewable energy sources more flexible. The facility can store up to 30 MWh of energy and boasts maximum scalability at a low investment cost. The pilot facility is currently in the final construction phase, and all of the storage facility’s buildings and main components have already been completed.